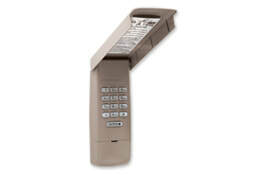 Open or close your garage door without using a remote control or key. The 877MAX LiftMaster® Wireless Keyless Entry System can open the door using a private 4-digit code you program directly into the unit. You can also program it with temporary access codes for visitors or delivery and service personnel so they can gain access to your garage without having to give them your personal code. Plus, it works with all LiftMaster® garage door openers manufactured since January 1993. Compatible Raynor openers: Admiral, Admiral II, Airman, Airman II, Aviator, Aviator II, Corporal, Corporal II, Commander, Commander II, Endeavor, General II, Pilot, Pilot II, Navigator, Prodigy, Prodigy II, Ultra, Ultra II. Other Raynor openers (Flitestar & R-Series) may be compatible....please email us at Keyless@GarageDoorZone.com to confirm the opener has the correct radio equipment. Whether you are troubleshooting an 877MAX keypad or looking to program a Liftmaster 877MAX the 877MAX Manual instructions below should help. You can view or download the following 877MAX Liftmaster Wireless Keyless Entry programming instructions.